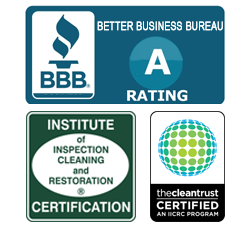 Aaron’s Restoration is a member of the Institute of Inspection Cleaning & Restoration. According to IICRC Reference Guide for Professional Water Damage Restoration, there are three categories of water damage to buildings. Water that originates directly from a sanitary source is considered Category 1 water damage. When Humans are exposed to Category 1 Water Damage – through the skin, inhaled or ingested – it does not cause harm to humans. Category 1 Water Damage is free of harmful bacteria or toxins. Category 1 water, however, may become contaminated as it mixes with dirt, passes through walls, decking, subflooring or picks up toxins or bacteria. Time and temperature can also cause bacteria to grow in Category 1 water. Category 2 Water has with bacteria present, but does not contain solid waste. Category 2 water can cause discomfort or sickness if inhaled or ingested by humans or pets. When you experience water damage, the longer you wait, the worse it can get. Never allow the water to sit because the risk of bio-hazard increases with time and temperature. In less than 2 or 3 days, category 1 water can turn into category 2 water – and eventually it will become category 3 water as other bacteria and pathogens begin to grow and multiply.